Michelle Obama on the Power of Story | Kid Reporters' Notebook | Scholastic Inc. Earlier this month, former First Lady Michelle Obama published Becoming, a memoir about her journey from the South Side of Chicago to the White House. On November 14, Obama spoke about her new book with talk show host Oprah Winfrey. The conversation took place at the United Center in Chicago. Thousands of people waited in long lines in the frigid weather for a chance to see the former First Lady. When Winfrey introduced her, the crowd of more than 14,000 erupted in applause. Becoming delves into Mrs. Obama’s childhood and takes her through her family’s eight years in the White House. Mrs. Obama’s husband, Barack Obama, served as president from January 20, 2009, until January 20, 2017. The former First Lady chose her hometown as the first stop on a worldwide book tour. Her daughters, Malia, 20, and Sasha, 17, briefly appeared in a videotaped message to show their support. “I remember the night in Chicago,” Malia said, recalling her father’s presidential victory in November 2008. “People were just so happy. I think seeing other people cry and scream highlighted how insane it was that that just happened.” Mr. Obama is the first African American in history to be elected president. Former First Lady Michelle Obama sits down with talk show host Oprah Winfrey at the United Center in Chicago. During the conversation with Winfrey, Mrs. Obama recalled nightly dinners in her childhood home. Everyone would share stories about their day, she said. It was a chance for her and her older brother, Craig Robinson, to let out their feelings. While they had a loving home, the two coped with the family’s tight finances, their father’s declining health, and a world that was often hostile to African Americans. In 2016, Mrs. Obama spoke with members of the Scholastic News Kids Press Corps in the Map Room of the White House. After graduating from Princeton University and Harvard Law School, Mrs. Obama worked at a top law firm in Chicago. She was largely focused, she said, on achieving her personal goals. Then she met her future husband, Barack Obama. He helped shift her interest to raising a family and giving back to the community. 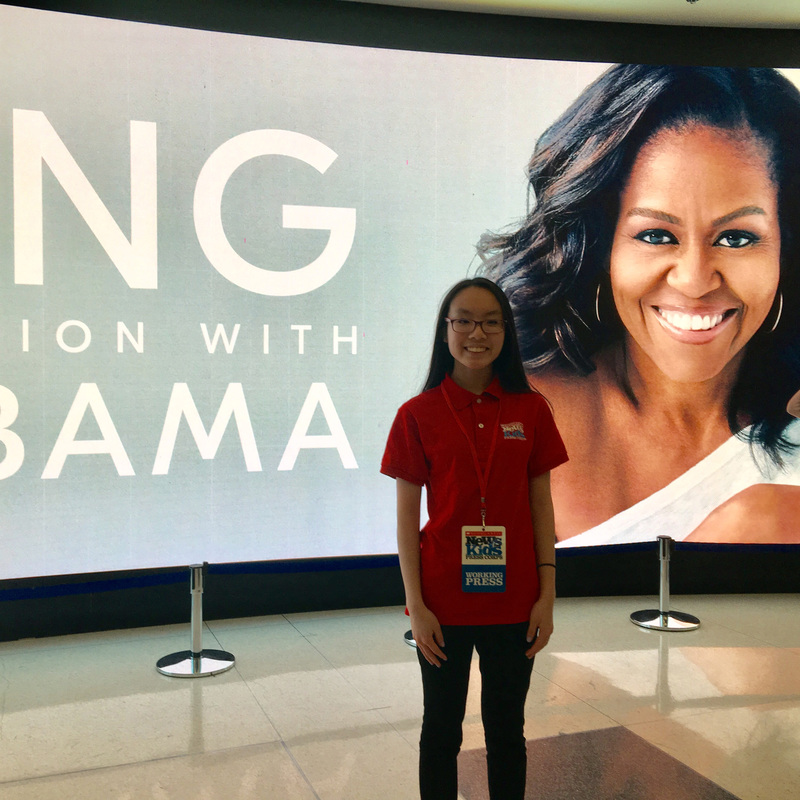 At the United Center, Mrs. Obama also shared the stories and photographs of others who are chasing their own dreams. Some want to be astronauts. Others want to be doctors, and even princesses. Members of the audience cheered after each story and spoke about their own dreams. Many people said that they could relate to Mrs. Obama’s personal struggles. “I’ve learned that my story does matter,” the former First Lady said. “I love my story. It is the American story. My struggles. My journey.” Then she encouraged members of the audience to create their own stories.